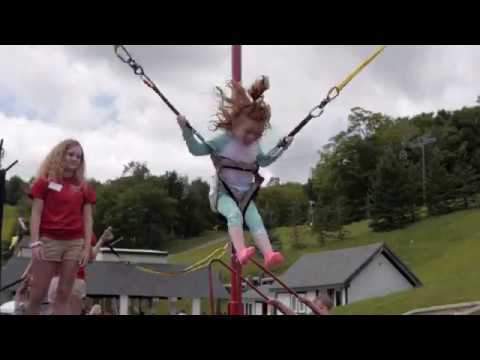 The Mountain Adventure Park at Vermont's Summer Adventure is packed with family fun for all ages. Shoot the rapids on the Big Splash, shoot some hoops, or shoot a hole-in-one. Ride the fast track on the triple-track Alpine Slide, tackle the Giant Swing, or throw a back flip on a Trampoline thing. Your adventure awaits! The Grand Daddy of them all… Bromley is home to North America's first triple-tracked Alpine Slide and still one of the longest slides in the world - a full 2/3 of a mile. Must be at least 3 years old and 38” tall to ride. Children 38”- 48” ride free, but must ride with an adult age 18+. Individuals over 48” must ride solo. Watch this video to see the Alpine Slide in action! An uber-challenging 24' multi-faced "real-rock" wall with different faces for different challenges. Open toed shoes not permitted, must weigh between 40 and 250 lbs. Watch this video to see the action on the Climbing Wall! Truly beautiful and scenic, it's the Augusta National of miniature golf courses... in our humble opinion, of course. Watch this video to preview the action on the course! Four, count 'em, Four Trampoline Things in the lineup! Slip into the harness and take trampolining to new heights. Must weigh between 30 and 200 lbs. to ride. Watch this video to check out high flying Trampoline antics! Round and round you'll go until you yell "Stop!" It's a four-rider, self-propelled spinning sensation! Maximum weight is 180 lbs per rider, minimum height of 36". Watch this video of the Twin Spin in action! Race against a friend as you actually pedal your way into orbit - like a bicycle race turned on its head! Must be at least 59" tall to ride. Watch the Space Bikes in action! Bring on the Splish, Splash and Bounce with our super duper new air slide! Slide closes for the season after Labor Day. Kids 42 - 60" tall, please. At 456' long, the Splash is Vermont's coolest water slide ride. Maximum weight per raft is 375 lbs. for either one or two riders; children under 42" must ride with an adult. The waterslide is weather dependent, and closes for the season after Labor Day. Watch this video for maximum splash! A nautically-nifty perennial favorite. Aye-aye! Must be under 48" to ride. Watch this video for bumper boats in action! Wonderfully bouncy with some serious "boinging" goin' on! Must be under 48" to ride. It looms as high as a four-story building, swings riders at speeds approaching 40mph, and produces 3G's of gravitational force. Maximum weight of 300lbs., minimum height of 48", minimum age of 6 years old required to ride. Take a leisurely ride up the chairlift and enjoy the awesome views from our south-facing slopes. Whether leaf-peeping, or summer site-seeing, a scenic ride is a great way to enjoy Vermont! Minimum height 38” and minimum age of 3 years. Under 48” tall ride free, but must ride with ticketed person age 18+. Challenge a buddy, team up, or make a friend... but not for long! Shoot the most baskets, and you won't get wet. Watch this video for shoot & showery action!